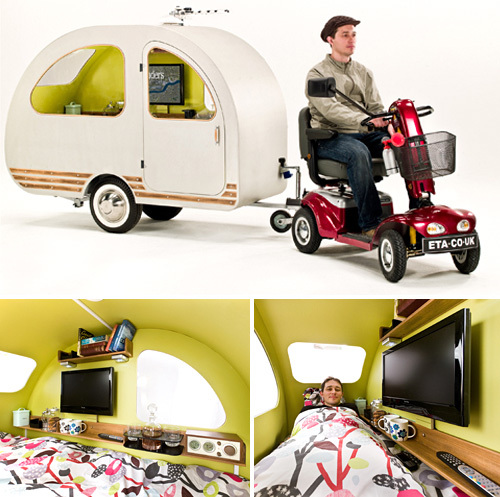 QTVan Camper Trailer Designed For Use With Electric Scooters | OhGizmo! It’s not an April Fool’s Day prank given it was posted just last week, but I’m pretty sure the QTVan trailer, which was developed by Britain’s Environmental Transport Association, is not actually available for sale. They claim they “developed the QTvan to highlight the estimated 220,000 people who use a mobility scooter without breakdown cover and face the prospect of a very long wait should they suffer a mechanical fault or their battery runs flat.” And since the ETA just happens to also sell insurance specifically designed for electric scooters, I’m pretty sure we’ve stumbled across another viral web campaign. Which is unfortunate because the ETA website points out the many highlights and amenities of their $9,000+ (£5,500) QTVan trailer like its 19-inch LCD TV, radio, alarm clock, book shelves, full-sized single bed and kettle, making it seem like a pretty awesome place to crash if your scooter isn’t going to make it home. They also point out that it makes waiting in line for a glimpse of the royal wedding procession later this week a lot more civilized than sitting on the sidewalk on a lawn chair or in a tent. Why not just carry a spare battery? Plus the juice you would use towing this sucker and powering the TV, radio, etc has to be way more than the scooter requires. Single?? Hell I’m married and I want one, I want to play campout after I use the scooter after a hard day scooting around, lol… My retirement will be so much fun with cool gadgets like these!!! I feel like I just saw Mr. Bean’s trailer. It would be pretty cool if you’re going to attach a mini-cooper instead of a scooter. I like the idea, but it still feel pretty cramped up for some reason. Oh and I just thought of it. It’s going to hurt your eyes when you watch TV with this baby. You’re so close to it. Look at the picture! The viewing angle! Ouch. Tell me the TV swings out or something.